I never thought I’d be able to learn to knit. My mom crochets, but I never wanted to learn growing up. I should have in hindsight. When my best friend called me and asked if I wanted to join with a few friends for her mother-in-law to teach us to knit I said sure. Not that I really needed another hobby or another thing to do, but I did. I never imagined how relaxing knitting could be either. So once I learned I made a couple of dishcloths that I shared here and here. I started knitting an easy shawl last spring sometime around April I think. It was either my sister or Squirt that asked if I was an old lady since I was knitting a shawl. They think they’re funny. I do get cold at church sometimes though so I thought this would be perfect. I’ve worked on it off and on since then and finally finished it last week. Thought I would share it here. Here’s a link to the pattern. This site has a number of free patterns. You have to register and log-in, but that’s worth the free patterns. 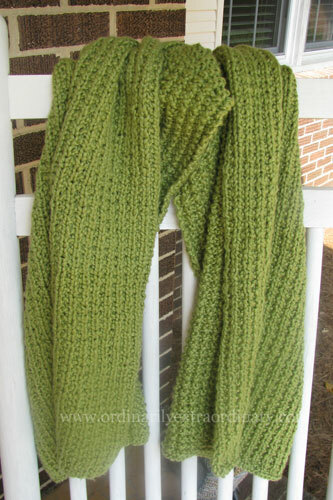 I used the yarn it called for in the pattern which is Lion Brand Nature’s Choice Organic Cotton. I chose the Pistachio color. The pattern was very simple to follow although it took a while since it used 5 balls of the yarn. Now I’m starting a scarf. Hoping it won’t take near as long and that I’ll have it ready once December rolls around. this looks lovely! i had a friend who taught me how to knit, but after all the work of making a hat and mittens for my Squirt, who was about 7 at the time, refused to wear them! knitted washcloths are simply the BEST! any chance you’d make me some? i’d be willing to pay you. contact me if you’re interested. btw, the picture of your son playing with his legos brought back memories for me. my boy is now almost 16, so we don’t have that sight at our house anymore, but there were many days…good thing you captured it for posterity. First of all, I LOVE that color! Second, WOW… good job. I had decided I wanted to crochet awhile back but my hands are too far gone to be able to do that kind of work. I love that you bit the bullet and dove into knitting.